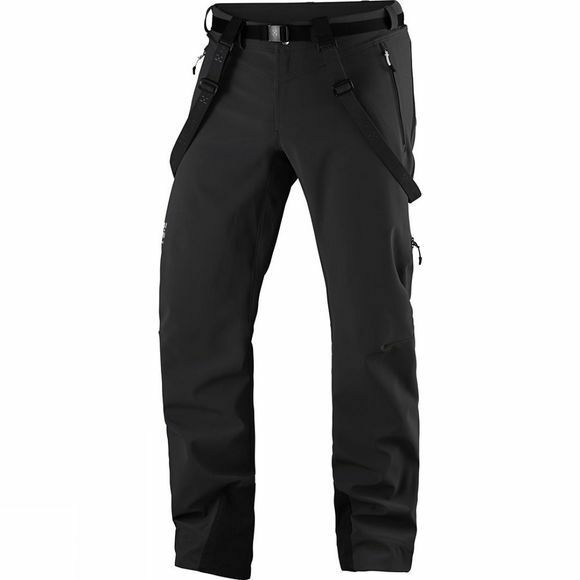 Comfortable windblocking trousers for skiing, designed to work with your other equipment and fit brilliantly. Pants like these need to fit well, be tough and offer good protection, and that exactly what the Men's Rando Flex Pants do. FlexAble fabric shields you from wind and water, providing an abrasion-resistant and breathable layer. The durable, woven outer face is backed by mesh to facilitate wicking: additional DWR treatment on the surfaces keeps water out and dirt off. These trousers are also designed to fit the rest of your kit without any problems. Unzip the rear gusset when it's time to fit the leg of the garment over your boot, zip it away again when you're walking. The snow gaiters are elasticated and opened with poppers, and the adjustable braces can be detached if not required. Three pockets provide space for your stuff; and there are ventilation zips on the legs for temperature regulation. The garment is articulated at the knees for ease of mobility. Reflective details boost your safety at dusk or dawn.